Think of the Feng shui Bagua (Pa-Kua) as the ultimate energy map of your home. 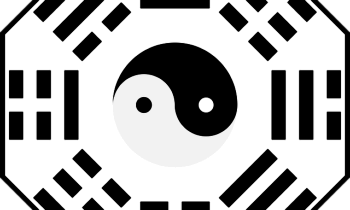 Use the Bagua Map for prosperity and love, for fame and reputation in the office, but also for health and family. If you haven’t heard of this before, it’s not very surprising. It doesn’t lend itself to an easy description like the five essential elements do. 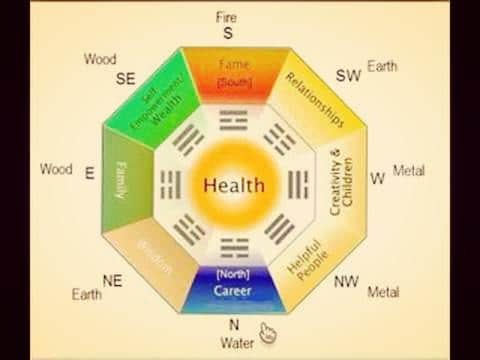 The Bagua map is represented by the 5 feng shui elements: fire, water, wood, earth and metal. The harmony in a living space(home, office) is influenced by the energy in each cardinal point (N, E, S, V). The positive energy present in every corner of the house attracts harmony in relationships, a good financial situation and longevity.This energy has a special influence on each individual as to each aspiration in life related to love, career, health. The classic map of the Feng shui pa gua is an octagon, with eight sides. Think of a stop sign and that’s exactly the shape of the map you’re about to overlay on the outline of your house. Each side of this octagon corresponds with a specific direction. And not surprisingly, in the practice of the art of feng shui each direction represents a different area of your life. But more than that this map is intimately tied to the use of the five elements we just learned about. Yes, the more you know about the layout of your house – from the view of the Feng shui pa gua – the more effective you’ll be in using the five elements. Each individual side of the Feng shui pa gua is a different area or aspect of your life. Feng shui recognizes nine main life centers. Ha! You’re already wondering – eight sides, nine areas? What’s up with that. Eight of the life aspects radiate out from the sides of the octagon. One aspect is neatly tucked inside the octagon! Each aspect is assigned a fraction of your home. You may find that some purists assign specific geographical directions with these areas. And while all feng shui experts recognize this, it’s also a matter of tradition to start at your front door and place the area of the map corresponding with the career aspect over the floor plan of your house. You can also assign this map in the very same way to any room in your house. Simply take the feng shui pa gua map (energy map) and place it over the main entrance to any room – a bedroom, your home office or your kitchen for example – and then simply move counter clockwise through the map. Each wall and every corner has a corresponding life aspect. You may find at first, the assignment of actual directions and then the relative use of the map with the placement of the front door a bit . . . well, paradoxical. And indeed it might be. But, in some ways, it’s nothing more than different theories of placement. For our purposes, even though we’ve provided you with the directions, we’ll use the relative map which centers itself at the front entrance of a structure to indicate certain life sectors. It seems logical, moreover, that health would be placed in the center of it all. Makes perfect sense, now doesn’t it? After all, how many times have you heard people say – perhaps you among them – that if you don’t have your health, you have nothing! Even feng shui principles recognize it. Now, stand at your front door of your house. We’re going to apply this relative ba-gau map to your living room. Once you learn this description then you can visualize this map in reference to your entire house. The front door is considered the career area. You’re going to work counter-clockwise. That means the corner to your left represents the life sector of travel and helpful people. The wall on your left corresponds to children and creativity. The corner on the other side of the wall is associated with marriage. The “wall of fame” as it were is directly across from the career wall that you’re standing out. The next corner is your wealth and prosperity corner. (Just in case you’re lost at this point it should be directly opposite that first corner dedicated to travel. This means that the wall that is directly opposite we’ve assigned to children is family. The only corner remaining – which is directly to your right as you stand at the doorway is knowledge, skills and wisdom. Whew! That quick “feng shui tour” of your house may make you a little dizzy, but before you know it, you’ll have all those areas memorized. Later in this chapter, we’ve provided you with an alternative map that is in use by some. It outlines the house according to “squares.” But you can get a feel for the placement of these areas relative to your front door. By the way, on this map, we’ve also included the directions, just in case you feel more comfortable using this technique. In addition to the directional assignment, each life aspect also possesses one of the five essential elements and its colors and shapes. And again we’ve also included the very traditional directions in this as well. North, which is the life aspect of career and recognition, is intimately tied with the water element and the colors of blue and black. Especially effective here is the color black. The northwest area of your home (the area to the left of your doorway) corresponds to the life aspect of discovering helpful people, traveling and blessings. The essential element that enhances this area is metal with its colors, gray, sliver, gold and white. Want to be more of a blessing to others? Then concentrate on white and gray. If you’re concerned about your children or about creative than you need to know than the direction assigned to the life aspect, west, is especially sensitive to energy that emanates from the essential element metal and its colors of white, gray, silver and gold. If you desire to especially enhance this section of your life, then concentrate on using the color white. The life aspect of love and marriage or relationships is found in the southwest of your home and uses the element of earth to create qi. The colors of this life aspect then are yellows and browns as well as cool or muted shades of orange. Here again if you read certain books or search web sites you might see some feng shui practitioners recommend the use of pink. In your home, the South and its life area of fame and reputation uses the element of fire and the colors that symbolize and create positive energy related to this element, oranges, reds, bright yellows and even purple. To be especially effective at creating healthy qi and increasing your fame, popularity or reputation, think red, red, red. The direction of southeast and its inherent life aspect of prosperity and wealth also utilize the element of wood and its colors of greens and light blues. Especially useful at creating wealth energy is the color green. Don’t be surprised, though, if as you continue learning about his ancient art, you discover that some experts recommend the color purple. The direction of east and its life aspect of the family is represented by wood and the color green and all of its shades and light blues. If you want to be most effective here at creating a healthy family life, concentrate on the color green. The Northeast of your home, whose assigned life aspect is knowledge and skills, is represented as an element by earth and the colors of the muted oranges and yellows. Some feng shui experts will even tell you that some brown in this area would work wonders at unlocking qi in this area. In the center of it all, neatly tucked in the middle of the “stop sign” itself is the life aspect of health and well being. Health is represented by the earth element and its colors of muted oranges and yellows – especially the yellows.